Today the country woke up to the news of Karti Chidambaram, son of P. Chidambaram, who was the Finance Minister during Congress regime has been arrested by the CBI in connection with the INX Media case. While the Congress party cried foul and as usual alleged ‘political vendetta’, it is necessary to try and understand what Karti Chidambaram is really accused of. For that purpose, it is necessary to go through the FIR filed by the CBI last year in May against the accused. As also detailed in the court order allowing detention of Bhaskar Raman, Karti Chidambaram’s CA, INX Media Pvt. Limited vide its application dated 13.03.2007 had approached the Chairman of Foreign Investment Promotion Board (FIPB) seeking permission to issue up to 14,98,995 equity shares of Rs. 10 each and up to 31,22,605 convertible, non-cumulative, redeemable preference shares of Rs. 10 each collectively representing 46.216% of the issued equity share capital of INX Media on an ‘as converted’ basis to three NRI investors under the FDI route and the said approval was sought from FIPB. In the CBI FIR, the proposal put to the FIP Board clearly mentioned the inflow of Foreign Direct Investment (in INX Media, Director – Indrani Mukherjea) to the extent of Rs. 4,62,16,000 (Rs. 4.62 crores). The FIPB Unit also clearly stated that for downstream investment in INX a separate FIPB approval would be required. According to the CBI FIR, INX Media (Director – Indrani Mukherjea) deliberately and in violation of the conditions laid down made a downstream investment to the extent of 26% (Downstream investment means indirect foreign investment by one Indian company into another Indian company by way of subscription or acquisition of shares) in the capital of INX News (Director – Peter Mukherjea) without approval from FIPB. The downstream investment included indirect foreign investment by the same foreign investors. INX Media also generated more than 305 crores of FDI, whereas only an inflow of 4.62 crores was approved. 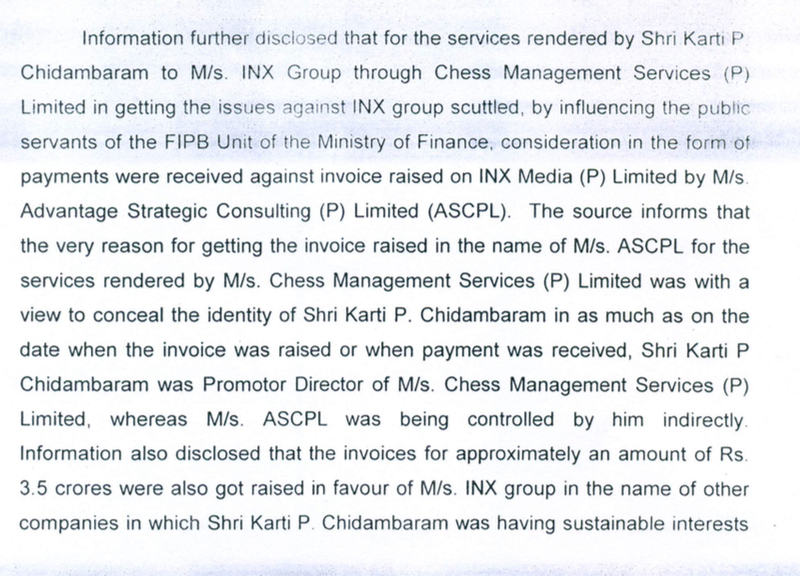 Perhaps the most scathing allegation in the CBI FIR was that INX Media in order to wriggle out of the situation entered into a “criminal conspiracy” with Karti Chidambaram (Promoter Director of Chess Management Services Pvt Ltd) hoping that Karti would be able to influence public servants of the FIPB Unite of the Ministry of Finance, because the Minister of Finance, P Chidambaram, was Karti’s father. 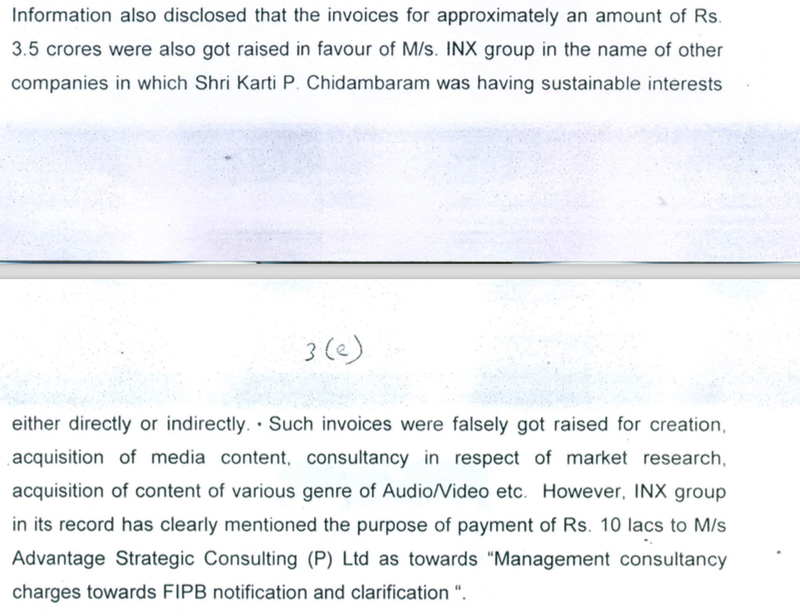 The FIR also mentions that due to the Karti Chidambaram’s influence, but virtue of being the Finance Minister’s son, the concerned officers of FIPB Unit of the Ministry of Finance ignored the serious illegalities on the part of INX Media (Indrani’s firm) and deliberately showed undue favours to INX by abusing their official position. They advised INX News (P) Ltd (Peter’s firm) to apply afresh for FIPB approval in respect to the downstream investment which had already been made by INX Media Pvt Limited. Officers of FIPB also ignored the request of the department of revenue to investigate. The CBI FIR clearly points towards to involvement of P Chidambaram as well. 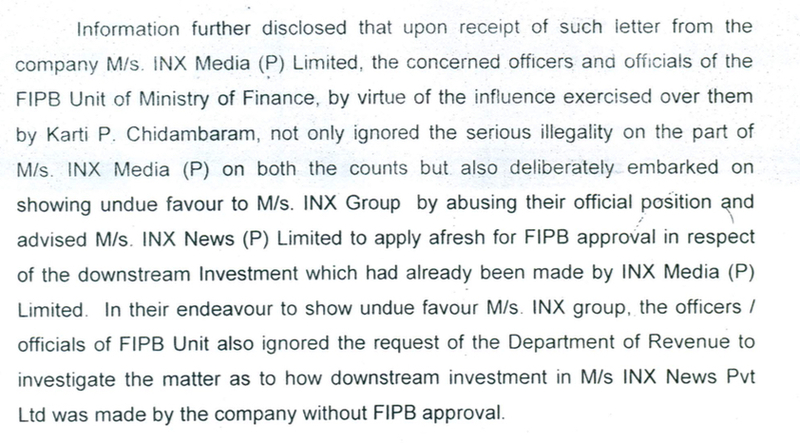 It mentions how INX News Pvt Ltd had concealed that they already have received 26% investment including FDI and owing to a “criminal conspiracy”, they again approached FIPB Unit of Finance Ministry seeking permission for downstream investment. The FIR calls it a “deceitful and fallacious” proposal. It also says that this proposal was favourably considered by the officials of Finance Ministry and “approved by the Finance Minister” (the Finance Minister at the time was P Chidambaram, Karti Chidambaram’s father). It says that this showed the malafide and dishonest intentions of the officials. The CBI FIR further alleges that the senior officials of the Finance Ministry misinformed the investigation being conducted by the investigation wing of the income tax department. The situation gets murkier in the following parts of the FIR. The FIR says that Karti Chidambaram actively tried to conceal his identity. The payment that Karti Chidambaram’s firm got in return of scuttling the probe and influencing officials from his father’s ministry was routed to Advantage Strategic Consulting (P) Limited (ASCPL) so as to keep Karti’s identity hidden. ASCPL was being controlled by Karti ‘indirectly’. The Director of ASCPL that time was Bhaskararaman who was close aide and family Chartered Accountant of the Chidambaram family. The FIR mentions that approximately Rs. 3.5 crores worth of invoices were raised in favour of INX group in the name of other companies that were directly or indirectly controlled by Karti Chidambaram. Such invoices were falsely raised for creation and acquisition of media content. However, INX group has in its records clearly mentioned that a payment of Rs. 10 Lacs was made to Advantage Strategic Consulting (P) Ltd towards “Management consultancy charges towards FIPB notification and clarification”. Here it must be remembered that Indrani Mukherjea (Director of INX Media) agreed to paying a 5 crore bribe to Karti Chidambaram. Karti Chidambaram has been arrested by the authorities today on the basis of this FIR which was filed by the CBI back in May 2017. 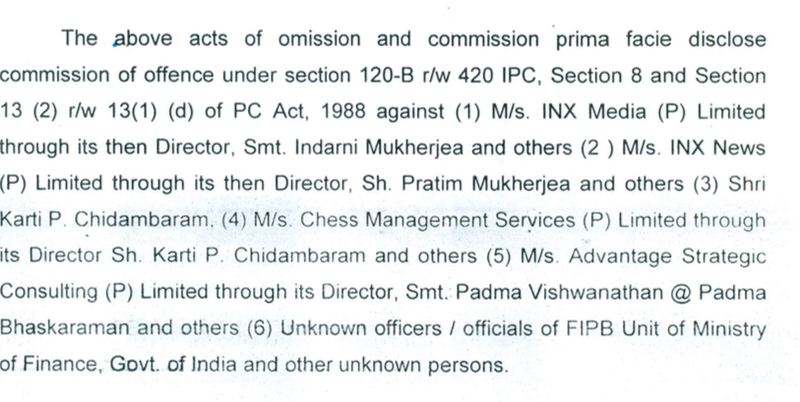 From the contents of the FIR, the nexus between Indrani Mukherjea, Peter Mukherjea and Karti Chidambaram with the active participation of Bhaskaraman is extremely evident. What is most sordid, however, is the impunity with which the Finance Ministry under FM P Chidambaram has acted, brazenly lying, breaking rules, committing crimes, to favour son Karti and his associates. The Congress Party may cry ‘vendetta’ all they like, the fact remains if the FIR is to be believed, there seems to have been massive improprieties committed even by the highest authorities in the Finance Ministry. Not to forget, Indrani Mukherjea’s confession that she paid a Rs. 5 crores bribe to Karti. The question remains this: After the fact that the malafide proposal was favourably considered by the officials of Finance Ministry and “approved by the Finance Minister”, P Chidambaram has emerged, can the Congress and Chidambaram’s really play the victim card and feign ignorance? With the scathing contents of this FIR, one can only wonder if it is a matter of time before P Chidambaram himself is called in to question for the deeds of his ministry.